Ten full days of winter wonderland fun will kick off with a Christmas Tree Bonfire and Ice Skating Party on Friday, January 27th. Partake in anything from guided hikes and the Winterfest Ball, to craft beer tastings and the highly competitive broomball tournament! Ski season is just around the corner! In Vermont, ski country is located off exit 10 of I89. This is where you can find most of Vermont’s premier and famous resorts and mountains. From large mountain resorts like Stowe and Sugarbush to smaller favorites like Bolton and Mad River Glenn, we have it all. Take a Breather this Autumn in Waterbury! As the heat wears off and the trees grow vibrant, Waterbury offers a multitude of destinations to enjoy the change in seasons. From exploring backroads or hiking through the ever-changing hillsides to strolling through our historic downtown stopping in shops and grabbing bites to eat, Waterbury is an ideal place for a quite retreat before the first snowfall graces us with its presence. Hello Spring! Good Bye Winter! 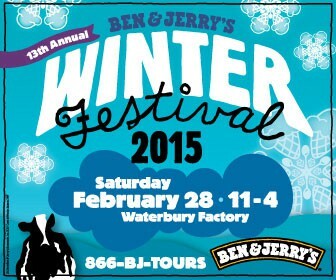 Ben & Jerry’s invites you to celebrate the last days of the season at our 13th Annual Winter Festival. Come rejoice in the wintery weather offerings with fun-filled outdoor activities for all ages on Saturday, February 28th 11:00-4:00 at our factory in Waterbury, VT.